If you read my Mustang Sally’s review, you know that I love cherry pie. Seriously, if I had to pick one fruit pie, this would be it. 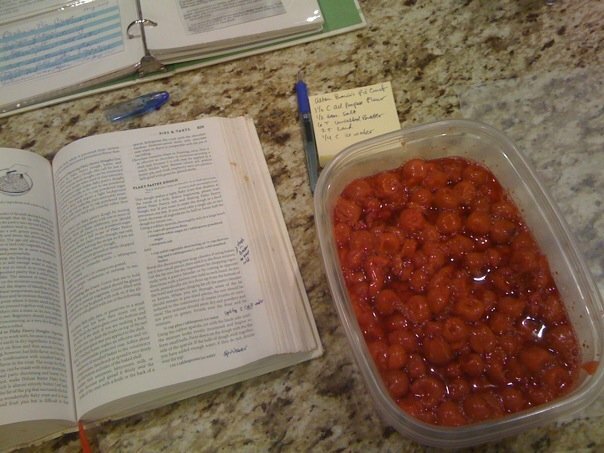 Now, in the old days, you had to wait until cherries were in season, but today, a couple three of cans of tart cherries, some flour, butter, and sugar, and you are good to go! The recipe follows, but it is mostly a riff on the Joy of Cooking’s pastry crust recipe combined with Alton Brown’s pie crust recipe. (I’m no pie making genius. I’m more like a pie eating genius.) But in any event, it’s pretty straight forward and easy. Let’s get started. When we built our home, we were fortunate enough to be able to put in a large granite island, perfect for rolling pasta and making pastry. Now most days it is covered with the mail, but on pie-making days, it’s all business. I like the mise-en-place method of cooking: read the recipe a couple of times to get the idea, and then get everything you need in place. With a busy career, it can be hard to fit in the fun stuff. That’s why there’s that big bottle of Coke on the counter; I was doing this late at night. The coffee cup keeps it pretty cold. Speaking of cold, it’s time to put a metal cookie sheet into your freezer. If you have two, put two. You’ll be glad you did later. Get your pie tin into the freezer, too. Let’s start with the filling. This is made up of three cans of tart cherries, lemon juice, cinnamon, and lots of sugar. No need for a too tart pie, here. I’ll add some cornstarch right before filling the pie. You can add almond extract if you like. They say it tastes like cherries. I think it tastes like marzipan. This mix will rest in the refrigerator until we fill the pie. Time to make the pastry! This is a riff on Alton Brown’s recipe from the I, Pie episode. If you don’t have his series of cookbooks, oh boy do I highly recommend them. The recipes are great, and there’s lots of extra goodies sprinkled throughout: extra riffs on his master recipes, deeper forays into the underlying theory and science. But I digress…. In any event, I used Alton’s measurements and ingredients and a combination of his pie theory with that of Joy of Cooking’s. You can see that I notate my cookbooks as I go. I like to have those memory trails for when I revisit the recipe months or years later. It reduces the chance of errors. And in pie making, I want to end up with pie, not errors. The pastry is made up of all-purpose flour, salt, frozen unsalted butter, frozen lard and ice water. Yes, I said lard. Lard is traditionally the soft white velvety fat that surrounds the kidneys of a pig. It doesn’t taste like pig, at all. And it’s lower in saturated fat and cholesterol than butter itself. That’s a win-win in my book. We use frozen butter and lard because we don’t want them to melt until they hit the oven, and by working it with our hands and a rolling pin, it heats up the dough and would start to melt them early. Besides, the frozen shapes create pockets that will become flaky layers of buttery pastry….mmmmnnn…. Here’s what the piecrust looks like when you start pulling it together. Make it into two balls; one for the bottom crust and one for the top. I like how it kind of looks like a ball riding on an ocean wave. Ok, it was late… Get the dough into the freezer to rest for 15 minutes. Time to roll out the dough. Pull out one of the metal cookie sheets you put in your freezer. 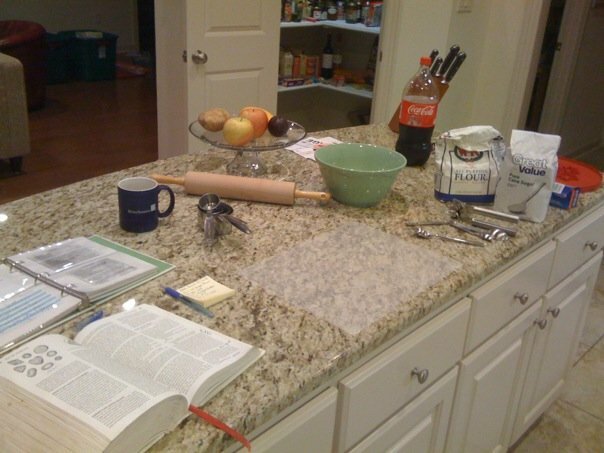 (You did do your mise-en-place, right?) Pull out one ball of dough. 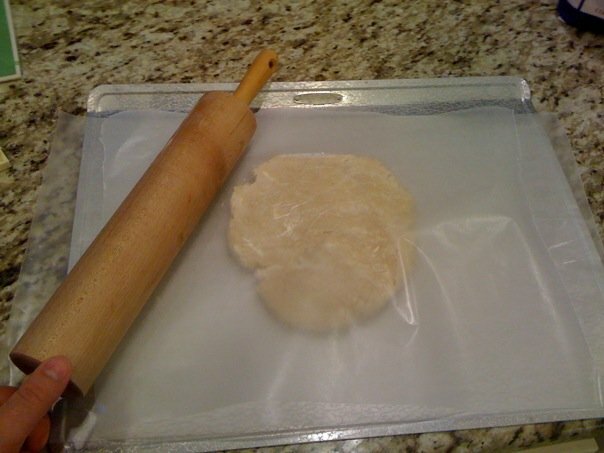 Rolling dough out between two pieces of waxed paper over a frozen cookie sheet is a secret Grammy never told you. That way the dough stays as cold as possible while you work it, and it also doesn’t stick to your rolling pin, so you don’t have to use your hands to touch, and warm up, the dough. The pan will warm up somewhat quickly, so swap it out for your second frozen pan when you need to. 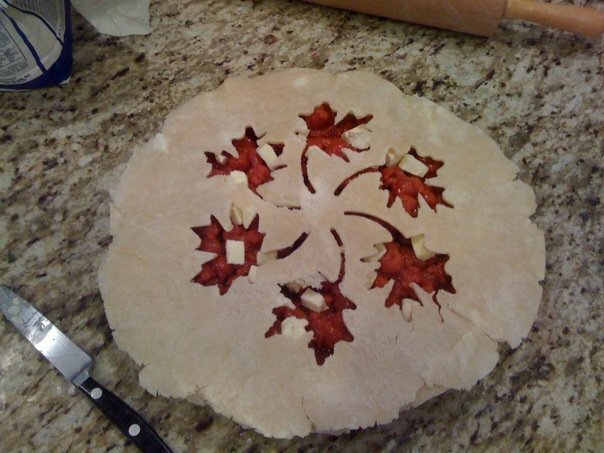 Since you used wax paper on the top and bottom of the piecrust, you can easily slide under the other frozen pan. It’s time to form it into the pie pan. Don’t forget to trim the edges of the pie crust to 3/4 of an inch past the edge of the pie. You’ll need that edge for crimping, later. Get this back into the freezer for 15 minutes. You want to re-freeze the butter and lard that softened while you worked with it. It’s time to fill this with the sour cherry mix. 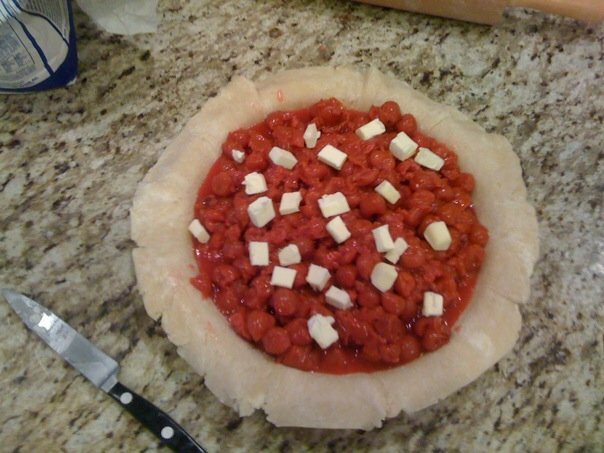 Use a slotted spoon to spoon the cherries into the pie. You want as little juice as possible, say only 1/4 cup or so, or it will be a mess later on. If you get too much juice, make a slurry of cornstarch with about 1/4 cup of juice and add it to the pie. That will thicken it up once it cooks. Get your cookie pans back in the freezer because you will need them for the top crust. Time to dot the pie with chunks of ice cold butter. Now it’s time for the top crust. Pull out the top crust and roll it out just like before. If you have a fancy top like I do, it makes for a pretty pie. If you are skilled with a knife, you can do it by hand. Or you can just lay the top crust over the pie, crimp it, and add three slits. That’s easy, and works just as well as fancy does. No one has ever turned down pie for looks. Here’s the secret: brush the top with milk or egg and then a fine dusting of granulated sugar. It will brown up beautifully. This also means that you will need to make tin foil edge protectors and put them on the rim about 35 minutes into the baking, or you’ll end up with dark crunchy edges, which are not tasty at all. Bake it at 425 degrees for thirty minutes, and then add the foil edge protectors. Turn the oven down to 350 degrees and bake it for 25-30 minutes more. I like to bake things on a pizza stone. I think it gives a nice even heat to the bottom of the pie. Here’s my girl! No worries about the leakage on the top. I could have used more cornstarch. It’s more brown than it looks, and has a nice sweet crust with baked in sugar for a little bit of crunch. A nice sweet-crusted fruit pie. You could swap out the cherries for another fruit, and just adjust the sugar to taste. Put a metal cookie sheet into your freezer. If you have two, put two. You’ll be glad you did later, because you can swap them out and have less waiting. Get your pie tin into the freezer, too. Mix together all of the filling ingredients. Rest this in the refrigerator until you fill the pie. Time to make the pastry! The pastry is made up of all-purpose flour, salt, frozen unsalted butter, frozen lard and ice water. (Yes, I said lard. Lard is traditionally the soft white velvety fat that surrounds the kidneys of a pig. It doesn’t taste like pig, at all. And it’s lower in saturated fat and cholesterol than butter itself. That’s a win-win in my book.) We use frozen butter and lard because we don’t want them to melt until they hit the oven, and by working it with our hands and a rolling pin, it heats up the dough and would start to melt them early. Besides, the frozen shapes create pockets that will become flaky layers of buttery pastry….mmmmnnn…. Mix the pie crust ingredients together in a large bowl. Pull it together with a spatula or spoon, not your hands. pulling it together. Make two balls; one for the bottom crust and one for the top. 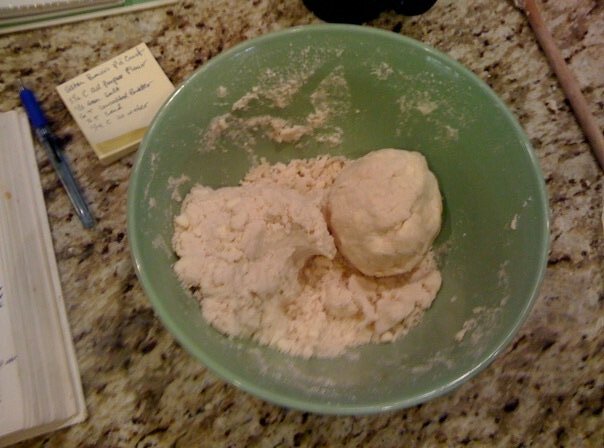 Get the dough into the freezer to rest for 15 minutes. After 15 minutes, it’s time to roll out the dough. Pull out one of the metal cookie sheets you put in your freezer. (You did do your mise-en-place, right?) Also pull out one ball of dough. Roll the dough out between two pieces of waxed paper over a frozen cookie sheet. That is a secret Grammy never told you. That way the dough stays as cold as possible while you work it, and it also doesn’t stick to your rolling pin, so you don’t have to use your hands to touch, and warm up, the dough. The pan will warm up somewhat quickly, so swap it out for your second frozen pan when you need to. 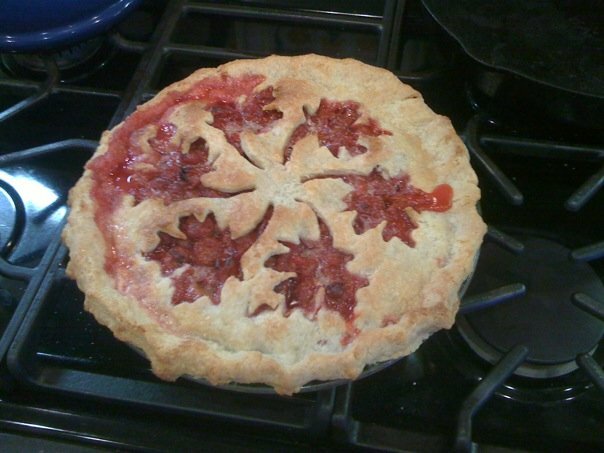 Since you used wax paper on the top and bottom of the piecrust, you can easily slide under the other frozen pan. It’s time to form it into the pie pan. 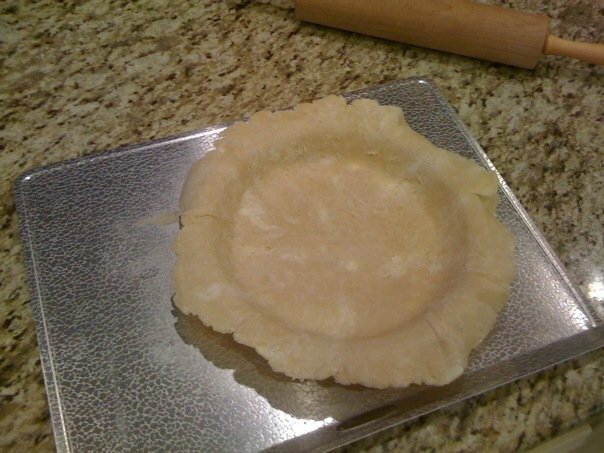 Don’t forget to trim the edges of the bottom pie crust to ¾ of an inch past the edge of the pie. You’ll need that edge for crimping, later. 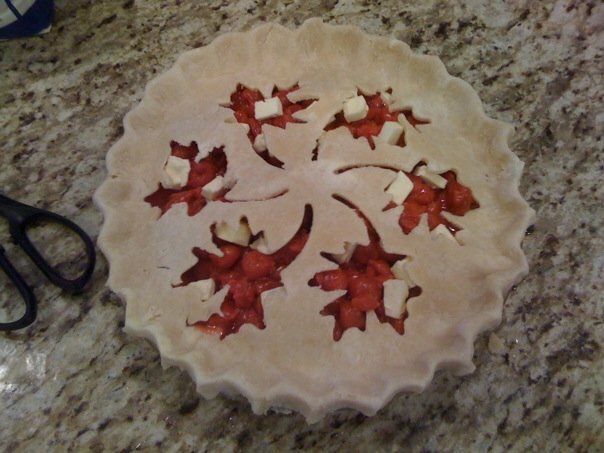 Once it is trimmed, get the pie crust back into the freezer for 15 minutes. You want to re-freeze the butter and lard that softened up while you worked the dough. Pull the sour cherry pie filling out of the refrigerator. 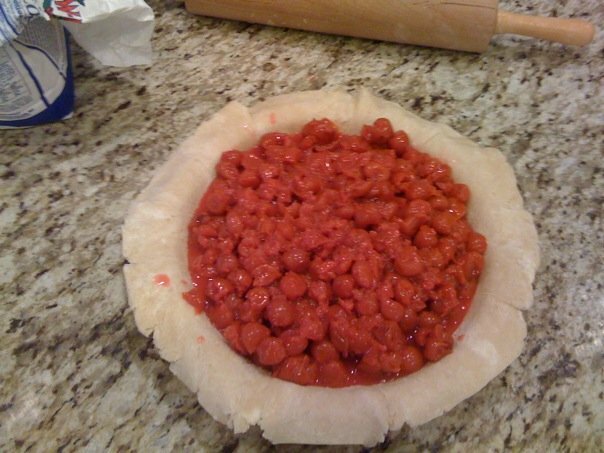 Use a slotted spoon to spoon the cherries into the pie. You want as little juice as possible, say only ¼ cup or so, or it will be a mess later on. If you get too much juice, make a slurry of cornstarch with about ¼ cup of juice and add it to the pie. That will thicken it up once it cooks. Dot the pie with chunks of ice cold butter. Now it’s time for the top crust. Pull out the top crust and roll it out just like before. If you have a fancy top cutter like I do, it makes for a pretty pie. If you are skilled with a knife, you can do it by hand. Or you can just lay the top crust over the pie, crimp it, and add three slits. That’s easy, and works just as well as fancy does. No one has ever turned down pie for looks. Here’s a secret: brush the top with milk or egg and then a fine dusting of granulated sugar. It will brown up beautifully. This also means that you will need to make tin foil edge protectors and put them on the rim about 35 minutes into the baking, or you’ll end up with dark crunchy edges, which are not tasty at all. For this, you just take a 5” deep piece of tin foil, and fold it in half lengthwise into a 2.5” wide, double thick length of foil. Then curve that into a half-pie shape. Once you have enough of those to cover the whole edge of the pie, open the oven and very gingerly set them over the pie’s edges. Be careful because this is a hot process. You may want to use a pair of tongs or oven mitts to do this. 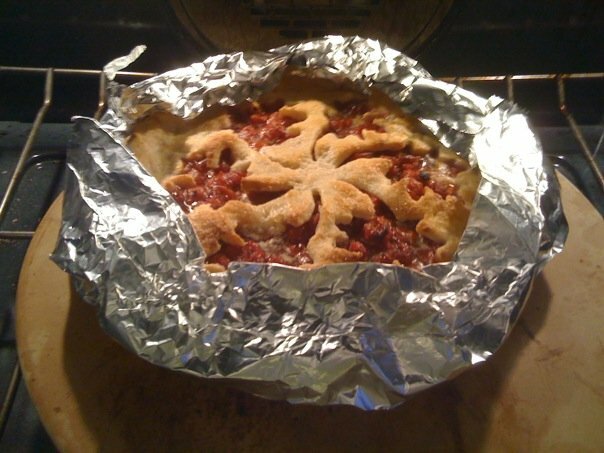 Bake the pie at 425 degrees for the first 30 minutes, then add foil edge protectors and cook for the remaining 25-30 minutes at 350 degrees. Let the pie cool completely before serving. This helps the fruit to stick together. If you cut it too early, it will run. But that’s kind of fun, too. Hey Sanford! Thank you for your question! I sent you a long response on email; let me know if you don’t get it! Cheers! I use WordPress, with the Genesis 2.0 engine, and Foodie 2.0! I really like it too!